Objective. To assess the kinetics of response to certolizumab pegol (CZP), and association between rapid response and longterm outcomes, in patients with active rheumatoid arthritis (RA). Methods. This was a post-hoc analysis of the randomized, double-blind RAPID 1 study in patients who received methotrexate (MTX) and either CZP 200 mg subcutaneously or placebo every 2 weeks for 52 weeks. Clinical and radiographic outcomes at Week 52 were evaluated based on the Disease Activity Score 28 (DAS28) ≥ 1.2 and American College of Rheumatology 20% (ACR20) responses at Week 6 and Week 12. Results. Clinical responses [European League Against Rheumatism (EULAR), DAS28 ≥ 1.2, and ACR20 responses] were rapid in CZP-treated patients. Week 12 DAS28 ≥ 1.2 responders had better clinical and radiographic outcomes at Week 52 compared with nonresponders. Among Week 12 responders, incremental benefit of earlier response was observed: Week 6 DAS28 ≥ 1.2 responders and ACR20 responders had significantly higher ACR response rates and were more likely to achieve remission at Week 52 than Week 12 responders. Patients with a clinical response at Week 6 had faster, more meaningful sustained improvements in patient-derived outcomes than those responding by Week 12 only. Conclusion. Rapid attainment of clinical response in patients with RA is associated with improved longterm outcomes. Analysis of the kinetics of response to CZP during the first 12 weeks of therapy potentially permits informed prediction of clinical success or need to alter treatment. In patients not achieving a clinical response at Week 12 treatment adjustment should be considered. Trial registration NCT00152386. Rheumatoid arthritis (RA) is a rapidly progressive disease for many patients. Persistent high disease activity leads to disability, comorbidities, and premature mortality. Consequently, development of treatment strategies to bring the disease under control quickly is of utmost importance. Close monitoring of disease activity and rapid interventions with synthetic disease-modifying antirheumatic drugs (DMARD)1 or combination therapy2,3,4 revealed better longterm clinical outcomes (at 1 to 2 years) in patients with RA. These studies, among others, clearly demonstrate the importance of rapid and sustained control of disease activity in order to prevent irreversible damage and loss of function. In this respect the tumor necrosis factor-α (TNF-α) inhibitors, which rapidly improve clinical signs and symptoms5,6,7,8 and health-related quality of life (HRQOL)7,9,10,11, and inhibit structural damage7,8,9,12, have been an important addition to treatment options for patients with RA. Certolizumab pegol (CZP), a PEGylated anti-TNF used either as monotherapy or with methotrexate (MTX), resulted in significant improvement in the signs and symptoms of RA from Week 18,13,14. CZP + MTX also rapidly inhibited the progression of structural damage (as early as Week 16) and were associated with rapid improvements in physical function/HRQOL and pain relief8,14. In addition to the short-term clinical benefits of a rapid response to therapy, a growing body of evidence supports the concept that the timing of response to treatment is an important predictor of the likelihood of treatment success. Patients who respond more quickly to therapy are more likely to remain on treatment and have better longterm improvement in disease activity15,16. To further examine the influence of onset of response to treatment on longterm outcomes in established RA, we assessed the kinetics of improvement in clinical outcomes following treatment with CZP + MTX in the RAPID 1 clinical trial8. This analysis was conducted in patients from a single homogeneous treatment cohort from the RAPID 1 clinical trial (the CZP 200 mg + MTX group was selected as this is the approved dose). The objective was to assess the effect of the timing of clinical response with CZP on a broad range of longterm clinical and radiographic outcomes at 52 weeks. This post-hoc analysis was performed on data collected during the RAPID 1 clinical trial of CZP + MTX8. Patients participating in this trial had moderate to severe RA disease activity and met American College of Rheumatology (ACR) classification criteria for RA17. Inclusion criteria for RAPID 1 included active disease at screening and baseline and an inadequate response to MTX treatment (≥ 6 months with a stable dose of ≥ 10 mg weekly for ≥ 2 months prior to baseline). The full methods of the RAPID 1 trial have been published8. In summary, RAPID 1 was a randomized, phase III, multicenter, double-blind, placebo-controlled study. A total of 982 patients who were MTX-inadequate responders were randomized 2:2:1 to treatment with 1 of 2 regimens of subcutaneous CZP [400 mg at Weeks 0, 2, and 4 followed by 200 mg (n = 393) or 400 mg (n = 390)] + MTX, or placebo + MTX (n = 199) every other week (EOW) for 52 weeks. Patients who failed to achieve an ACR20 response at both Weeks 12 and 14 were withdrawn from the double-blind controlled phase of the study at Week 16. Patients provided written informed consent prior to enrollment and the study protocol was approved by the local institutional review board or ethics committee at each participating center. In this post-hoc analysis of RAPID 1 we further analyzed ACR20/50/70 response rates18 and the DAS28-erythrocyte sedimentation rate (DAS28)19. Low disease activity (LDA) was defined as a DAS28 ≤ 3.2. Remission was defined as DAS28 ≤ 2.6. Improvement in disease activity as measured by DAS28 was classified according to the European League Against Rheumatism (EULAR) response criteria20. The modified Total Sharp Score (mTSS), joint space narrowing (JSN), and erosion score (ES) were determined8. Nonprogression was defined as a change from baseline in the mTSS of ≤ 0.5. Swollen (n = 66 joints) and tender (n = 68 joints) joint counts were also evaluated. Patient-reported outcomes included arthritis pain (pain) reported on a 0 to 100-mm visual analog scale (VAS), physical function reported on a range of 0 to 3 units using the Health Assessment Questionnaire-Disability Index (HAQ-DI)21, fatigue assessed on a 0 to 10 Fatigue Assessment Scale (FAS; a numeric rating scale)22, and HRQOL assessed using the Short-Form 36 (SF-36) health survey23. A decrease in DAS28 of ≥ 1.2 from baseline (DAS28 ≥ 1.2 response) at Week 12 has previously been shown to be important for longterm clinical outcomes24. To assess the importance of a clinical response at Week 12 on radiographic outcomes, the changes from baseline in mTSS, ES, and JSN were assessed in Week 12 DAS28 ≥ 1.2 responders versus nonresponders for all patients treated with CZP 200 mg + MTX. The analysis excluded 30 patients (7.6%) out of the 393 patients in the intent-to-treat (ITT) population due to nonimputable missing data. To assess the association between the kinetics of clinical response and longterm outcomes at Week 52, we evaluated patients from the CZP 200 mg + MTX arm who achieved a clinical response at Week 12. These patients were divided into 2 subgroups: Week 6 responders (who also responded at Week 12) and Week 12 responders (who failed to respond at Week 6 but responded at Week 12). Analyses were performed using 2 different clinical responder definitions evaluated at Weeks 6 and 12: the first was based on a DAS28 ≥ 1.2 response, and the second was based on achieving an ACR20 response. Patients with missing DAS28 or ACR20 results at Week 6 or 12 (this represents 17.8% and 16.8% of the CZP 200 mg ITT population for the DAS28 definition or ACR20 definition, respectively) or patients not responding at Week 12 were not included in either responder subgroup. A sensitivity analysis was performed in patients from the CZP 400 mg + MTX arm. ACR20/50/70 response rates, the proportion of patients with LDA and DAS28 remission, radiographic outcomes (change from baseline in mTSS, percentage of patients with no radiographic progression), improvements in swollen and tender joint counts, and patient-reported outcomes (pain VAS, HAQ-DI, FAS) at Week 52 were compared between early and later responders. EULAR good/moderate response rates at Weeks 6 and 12 were 67.4% and 77.6%, respectively, versus 27.0% and 29.1%, respectively, for placebo + MTX (p ≤ 0.001 by logistic regression). Similarly, ACR20 response rates for the CZP 200 mg + MTX group at Weeks 6 and 12 were 51.3% and 63.8%, respectively, versus 18.2% and 18.3% for placebo + MTX (p < 0.001 by logistic regression). At Week 12, ACR50 and ACR70 response rates were 32.9% and 15.2%, respectively, in the CZP 200 mg + MTX group. We first evaluated the outcomes at Week 52 in Week 12 responders and nonresponders. Baseline demographics and disease characteristics were similar between groups (data not shown). A higher proportion of patients treated with CZP 200 mg + MTX who achieved a DAS28 response ≥ 1.2 at Week 12 achieved DAS28 LDA at Week 52 compared with patients who did not (37.2% vs 6.1%, respectively)24. The present post-hoc analysis included 363 CZP 200 mg + MTX-treated patients, and 178 placebo + MTX-treated patients who had radiographic outcomes data. By the DAS28 ≥ 1.2 responder definition, 275/363 (75.8%) CZP 200 mg + MTX-treated patients and 49/178 (27.5%) placebo + MTX-treated patients responded at Week 12. We found that, at Week 52, DAS28 ≥ 1.2 Week 12 responders had lower mean changes from baseline in mTSS than Week 12 DAS28 nonresponders for both CZP + MTX-treated patients (0.18 vs 1.22, respectively) and placebo + MTX-treated patients (1.06 vs 3.57; Figure 1A). Importantly, CZP + MTX inhibited radiographic progression when compared to placebo + MTX in both responders (0.18 vs 1.06) and nonresponders (1.22 vs 3.57). These patterns were also noted for ES (CZP, −0.01 vs 0.29; placebo, 0.76 vs 1.82) and JSN (CZP, 0.21 vs 0.95; placebo, 0.51 vs 1.77) for responders and nonresponders, respectively. Further, at Week 52, more DAS28 ≥ 1.2 Week 12 responders than Week 12 nonresponders were mTSS nonprogressors in both the CZP (78.5% vs 69.3%) and placebo (69.4% vs 48.1%) groups (Figure 1B). Radiographic outcomes at Week 52 according to 6- and 12-week DAS28 ≥ 1.2 response at Week 12 (responder vs nonresponder). DAS28 ≥ 1.2 Week 12 responders had lower mean changes from baseline in modified Total Sharp Score (mTSS; A) and higher rates of mTSS nonprogression (B) than Week 12 DAS28 nonresponders. CZP: certolizumab pegol; MTX: methotrexate; PBO: placebo. We next asked whether a significant difference in Week 52 outcomes would be influenced by responses at Week 6 versus Week 12. 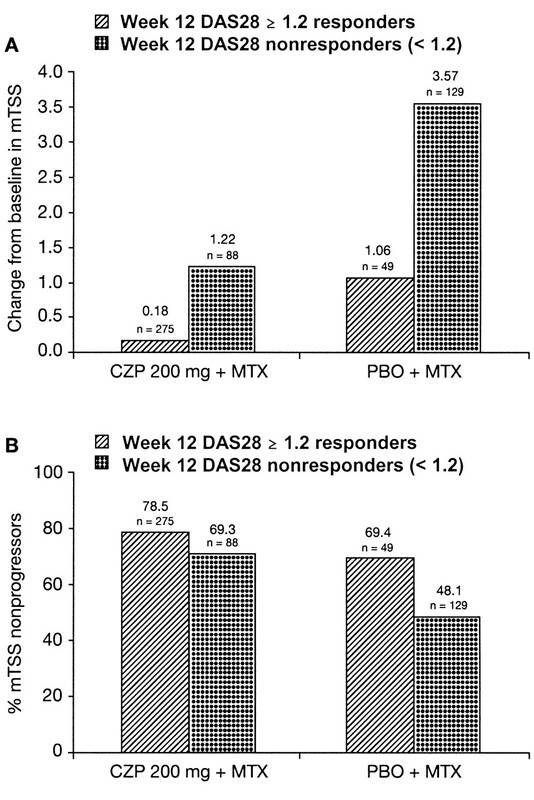 This post-hoc analysis included 240 and 244 CZP 200 mg + MTX-treated patients who achieved a DAS28 ≥ 1.2 or ACR20 response, respectively, at Week 12 of treatment. Based on the DAS28 ≥ 1.2 response definition, 195/240 (81.3%) patients achieved a response at Week 6 (sustained to Week 12); the remainder of the Week 12 responders (45/240, 18.8%) failed to achieve a response at Week 6 but subsequently achieved a ≥ 1.2-point reduction in DAS28 at Week 12. Patient demographics and disease characteristics at baseline in the 2 subgroups are shown in Table 1. Week 6 DAS28 ≥ 1.2 responders were approximately 4 years younger (mean 50.6 vs 55.0 years; p ≤ 0.05) than Week 12 responders and had a shorter mean duration of disease (5.45 vs 7.29 years; p ≤ 0.05). A higher percentage of Week 6 DAS28 ≥ 1.2 responders received ≥ 15 mg MTX at baseline than Week 12 DAS28 ≥ 1.2 responders (50.8% vs 37.8%), although the difference did not reach significance (p = 0.116). Disease characteristics at baseline were otherwise similar between the 2 subgroups. Baseline characteristics of patients in the CZP 200 mg + MTX responder subgroups. Based on the ACR20 responder definition, 172/244 (70.5%) patients achieved a response at Week 6 (with confirmation at Week 12); the remainder (72/244, 29.5%) failed to achieve a response at Week 6 but subsequently achieved an ACR20 response at Week 12. Baseline demographics and disease characteristics were generally comparable between these subgroups; however, a higher percentage of Week 6 ACR20 responders received ≥ 15 mg MTX at baseline than Week 12 ACR20 responders (50.6% vs 34.7%; p = 0.023; Table 1). Analysis of Week 6 and Week 12 responders demonstrated that a more rapid clinical response to CZP 200 mg + MTX was associated with significantly better clinical outcomes at Week 52. Thus ACR20/50/70 response rates at Week 52 were higher in patients who achieved a ≥ 1.2-point reduction in DAS28 at Week 6 compared with those responding only at Week 12 (p < 0.01; Figure 2). 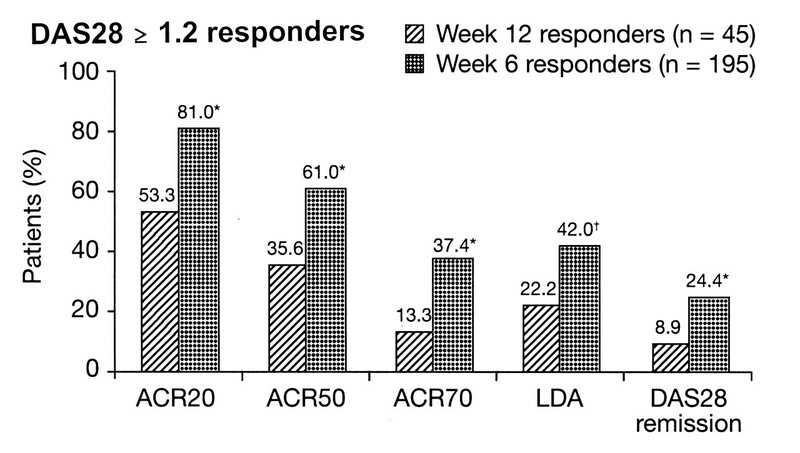 In addition, the proportion of patients with LDA and remission at Week 52 was greater in the population of patients who responded at Week 6 compared with those who responded only at Week 12 (p < 0.05; Figure 2). Similar outcomes were observed when patients were stratified based on their Week 6 and Week 12 ACR20 responses. ACR20, 50, and 70 responses in ACR20 Week 6 responders (n = 172) were 83.0%, 67.3%, and 39.8%, respectively, compared with 63.9%, 36.1%, and 18.1% in ACR20 Week 12 responders (n = 72) (p < 0.01). Comparable trends were observed for DAS28 LDA and remission. Interestingly, there was no difference in mTSS change from baseline between Week 6 and Week 12 DAS28 ≥ 1.2 and ACR20 responders at Week 52 (data not shown). Clinical responses at Week 52 in DAS28 ≥ 1.2 Week 6 and Week 12 responders. Proportions of ACR20/50/70 responders, patients with low disease activity (LDA), and patients in DAS28 remission at Week 52 were significantly higher among patients who achieved a ≥ 1.2-point reduction in DAS28 at Week 6 than in those with Week 12 responses only (*p < 0.01; †p < 0.05). A similar trend to better outcomes at Week 52 with a more rapid response was observed with pain, fatigue, physical function, and tender and swollen joint counts. Once again patients that had a more rapid (Week 6) clinical response to CZP 200 mg + MTX had faster, more meaningful improvements that were sustained to Week 52 than those who had a clinical response by Week 12. Further, greater mean improvements in pain, physical function, fatigue, and swollen and tender joint counts were also observed in patients who achieved an ACR20 response at Week 6 compared with patients who achieved a response at Week 12. Week 6 responders also had greater mean improvements in HRQOL than Week 12 responders, with greater improvements in the SF-36 physical component summary, but not the mental component summary, at multiple timepoints throughout the study (data not shown). In a sensitivity analysis, similar results demonstrating greater improvements in clinical and patient-reported outcomes in Week 6 versus Week 12 clinical responders were obtained for patients in the CZP 400 mg + MTX group (data not shown). This post-hoc analysis of the RAPID 1 study focuses on assessment of the kinetics of response to CZP as well as the effects of timing of response on clinical and patient-reported outcomes after 52 weeks of treatment. The findings show clearly that there are longterm clinical and radiographic differences between patients who respond by Week 12 and those who do not. An important finding in this study was that patients who failed to achieve a clinical response (defined as a DAS28 change ≥ 1.2) at Week 12 had greater radiographic progression at 52 weeks than patients who did achieve a response. This trend was observed in both the CZP + MTX and placebo + MTX groups, although the differences between responders and nonresponders were more marked in the latter group. Importantly, the addition of CZP to MTX inhibited radiographic progression in both the 12-week responder and nonresponder groups when compared with placebo. These results support the recent findings of Ichikawa, et al25, who found that in patients with early RA, ACR core set measures after 12 weeks of nonbiologic DMARD treatment predicted articular destruction 2 years later, demonstrating the importance of obtaining rapid control of disease activity in order to prevent longterm irreversible damage. Similarly, Smolen, et al demonstrated that attainment of remission or LDA at 3 months led to no or minimal progression of joint damage over a 1-year period in patients treated with MTX + infliximab26. All these findings support the notion that if a patient has not had a clinical response within the first 3 months of therapy, careful consideration should be given to adjusting therapy27. More detailed analyses of the Week 12 responder population demonstrated an incremental benefit for patients who responded earlier. Patients treated with CZP who had a clinical response at Week 6 demonstrated significantly greater ACR20, 50 and 70 responses, significantly higher rates of DAS28 LDA and remission, and improved patient-reported outcomes (pain, physical function, and fatigue) at the end of 1 year of treatment relative to patients who had a response at Week 12 but not Week 6. The greater improvement in physical function in the Week 6 responders is of particular significance as HAQ-DI has been demonstrated to be a strong predictor of disability and mortality28,29. Although all the measured outcomes were better in Week 6 than Week 12 responders, improvements greater than the minimum clinically important difference thresholds for pain, physical function, and fatigue were achieved in both Week 6 and Week 12 responder subgroups throughout the trial from the first week of treatment with CZP. Previous studies have shown that a response to treatment by Week 12 increases the possibility of LDA or remission after 1 year of anti-TNF therapy in patients with RA15, and that response to treatment as early as Week 6 may predict continuation of anti-TNF treatment16. However, the present study differs from the study by Aletaha, et al15 because it is focused on a cohort of patients from a single treatment arm of a placebo-controlled clinical study rather than a heterogeneous mixed population of patients from multiple different studies. Further, the present study examines the effects of kinetics of response on a much broader range of outcomes, including patient-reported outcomes and radiographic endpoints. It also focuses on defined populations of early versus late responders rather than disease activity over the treatment course with reference to disease state at Week 52 in the case of the Aletaha study15, although that investigation included stringent remission criteria as one of the outcomes. This study also differs from that of Gülfe, et al16, which examined only the effect of kinetics of response on treatment persistence. The results from our analysis clearly demonstrate that patients who do not achieve a clinical response at Week 12 are less likely to do well in the long term. Nevertheless, further prospective studies are required to evaluate the effect of disease activity at baseline as this study was a post-hoc analysis and clinical trial populations do not generally reflect the broad populations of patients seen in clinical practice. Despite these limitations, the findings of this work are consistent with those of a growing body of other studies and recent recommendations for RA management1,2,3,15,16,26,29,30,31,32. The present data suggest that adjustment of therapy in the population evaluated in this study should be considered at Week 12 for patients with inadequate initial clinical response (defined as DAS28 change < 1.2). Indeed, this was shown to be an effective approach in the GUEPARD study4. However, the question of when to change therapy for patients with some response but not having achieved the specified treatment goal is not addressed. Nevertheless, the recent EULAR guidelines advocate that the desired target should be achieved within a maximum of 6 months27. Putting our results into context in the clinical setting, we conclude that if patients have an early clinical response to CZP + MTX (by Week 6) they are more likely to have a better longterm clinical response and greater control of disease activity. In patients who show a slower or incomplete response, careful monitoring and inspection of the rate of improvement during the first 12 weeks of therapy may help to predict the potential benefit of continuing treatment. Further, the ability to predict longterm outcomes based on the onset of initial clinical response has the potential to reduce costs, decrease unnecessary drug exposure, and allow prompt access to alternative therapy. Further analysis of rapid responders to treatment may assist in future identification of biomarkers that predict sustained response to treatment. The findings from this study indicate that rapid attainment of clinical benefit in patients with RA receiving treatment with CZP is associated with improved longterm outcomes, with earlier clinical benefit being associated with better control of disease activity. We acknowledge the medical writing assistance and editorial services provided by Karen Munro, Linda Wychowski, and Ellie Ling from PAREXEL on behalf of UCB, Inc. We also thank Kristel Luijtens from UCB for support with the Week 12 DAS28 ≥ 1.2 responder versus nonresponder radiographic analyses. UCB sponsored the clinical trial from which these post-hoc analyses were performed. Dr. Keystone has grant/research support from Abbott, Amgen, AstraZeneca, BMS, Centocor, Hoffmann-Roche, Novartis, Schering-Plough, UCB, Wyeth; consultancy fees from Abbot, Amgen, BMS, Centocor, Genentech Hoffmann-Roche, Pfizer, Schering-Plough, and UCB; Dr. Curtis has grant/research support and consultancy fees from Amgen, Centocor, Corrona, Novartis, Roche, and UCB. Dr. Fleischmann has grants/research support from Amgen, Wyeth, Centocor, Abbott, Genentech, Biogen Idec, Roche, UCB, Regeneron, Lilly, Pfizer, BMS; consultancy fees from Amgen, Wyeth, Centocor, Abbott, Genentech, Biogen Idec, UCB, AstraZeneca, Pfizer, BMS, Roche, Lilly, Schering Plough, and GSK. Dr. Mease has grants/research support, consultancy fees, and honoraria from Abbott, Amgen, Biogen Idec, BMS, Centocor, Genentech, Lilly, Pfizer, Roche, Schering-Plough, Wyeth, and UCB. Dr. Khanna has grant/research support from Actelion, Gilead, Takeda, Savient, NIH; consultancy fees from Actelion, Fibrogen, MediQuest, Takeda, Savient, and UCB. Dr. Smolen has grant/research support and consultancy fees from UCB. Dr. Furst has grant/research support from Abbott, Actelion, Amgen, BMS, Genentech, Gilead, GSK, Nitec, Norvatis, Roche, UCB, Wyeth, Xoma; consultancy fees from Abbott, Actelion, Amgen, Biogen Idec, BMS, Centocor, Genentech, Gilead, Merck, Nitec, Novartis, UCB, Wyeth, Xoma; honoraria: Abbott, Actelion, Amgen, Biogen Idec, BMS, Centocor, Genentech, Gilead, GSK, Nitec, and Dr. Schiff has grant/research support and consultancy fees from UCB. Dr. Coteur and Dr. Davies are employed by UCB. Dr. Combe has grants/research support from UCB, MSD, Pfizer, Roche, Schering; consultancy fees from UCB, Abbott, GSK, MSD, Pfizer, Roche, and Schering. Accepted for publication January 11, 2011. Clinical and radiographic outcomes of four different treatment strategies in patients with early rheumatoid arthritis (the BeSt study): a randomized, controlled trial. Arthritis Rheum 2005;52:3381–90. Evaluation of two strategies (initial methotrexate monotherapy vs its combination with adalimumab) in management of early active rheumatoid arthritis: data from the GUEPARD trial. Rheumatology 2009;48:1429–34. Etanercept therapy in rheumatoid arthritis: a randomized, controlled trial. Ann Intern Med 1999;130:478–86. Adalimumab, a fully human anti-tumor necrosis factor alpha monoclonal antibody, for the treatment of rheumatoid arthritis in patients taking concomitant methotrexate: the ARMADA trial. Arthritis Rheum 2003;48:35–45. Sustained improvement over two years in physical function, structural damage, and signs and symptoms among patients with rheumatoid arthritis treated with infliximab and methotrexate. Arthritis Rheum 2004;50:1051–65. Certolizumab pegol plus methotrexate is significantly more effective than placebo plus methotrexate in active rheumatoid arthritis: findings of a fifty-two-week, phase III, multicenter, randomized, double-blind, placebo-controlled, parallel-group study. Arthritis Rheum 2008;58:3319–29. Radiographic, clinical, and functional outcomes of treatment with adalimumab (a human anti-tumor necrosis factor monoclonal antibody) in patients with active rheumatoid arthritis receiving concomitant methotrexate therapy: a randomized, placebo-controlled, 52-week trial. Arthritis Rheum 2004;50:1400–11.
. Improved health-related quality of life with effective disease-modifying antirheumatic drugs: evidence from randomized controlled trials. Am J Manag Care 2008;14:234–54.
. Certolizumab pegol (CZP) induces rapid and sustained clinically meaningful improvements in physical function and health-related quality of life (HRQOL) in patients with rheumatoid arthritis (RA): the RAPID 1 and 2 randomised clinical trials (RCTS). Ann Rheum Dis 2008;67:331. Etanercept versus methotrexate in patients with early rheumatoid arthritis: two-year radiographic and clinical outcomes. Arthritis Rheum 2002;46:1443–50. Efficacy and safety of certolizumab pegol monotherapy every 4 weeks in patients with rheumatoid arthritis failing previous disease-modifying antirheumatic therapy: the FAST4WARD study. Ann Rheum Dis 2009;68:805–11. Efficacy and safety of certolizumab pegol plus methotrexate in active rheumatoid arthritis: the RAPID 2 study. A randomised controlled trial. Ann Rheum Dis 2009;68:797–804.
. Six and 12 weeks treatment response predicts continuation of tumor necrosis factor blockade in rheumatoid arthritis: an observational cohort study from southern Sweden. J Rheumatol 2009;36:517–21. American College of Rheumatology. Preliminary definition of improvement in rheumatoid arthritis. Arthritis Rheum 1995;38:727–35.
. Measuring fatigue in rheumatoid arthritis: a systematic review of scales in use. Arthritis Rheum 2007;57:429–39.
. SF-36 Physical and Mental Health Summary Scales: A user’s manual. Boston: New England Medical Center, The Health Institute; 1994. DAS28(ESR) response at Week 12 is predictive of long-term disease activity in rheumatoid arthritis patients treated with certolizumab pegol. Ann Rheum Dis 2009;68 Suppl 3:543. Clinical activity after 12 weeks of treatment with nonbiologics in early rheumatoid arthritis may predict articular destruction 2 years later. J Rheumatol 2010;37:723–9. Radiographic changes in rheumatoid arthritis patients attaining different disease activity states with methotrexate monotherapy and infliximab plus methotrexate: the impacts of remission and tumour necrosis factor blockade. Ann Rheum Dis 2009;68:823–7.
. Health-related quality of life measurements and studies in rheumatoid arthritis. Am J Manag Care 2002;8:811–20.
. Cardiovascular co-morbidity in rheumatic diseases. Vasc Health Risk Manag 2008;4:605–14. American College of Rheumatology 2008 recommendations for the use of nonbiologic and biologic disease-modifying antirheumatic drugs in rheumatoid arthritis. Arthritis Rheum 2008;59:762–84. Probability to achieve low disease activity at 52 weeks in rheumatoid arthritis (RA) patients treated with certolizumab pegol (CZP) depends on time to and level of initial response [abstract]. Arthritis Rheum 2009;60 Suppl:S374.